Once in a while, I feature some old time radio-related memorabilia on the blog. 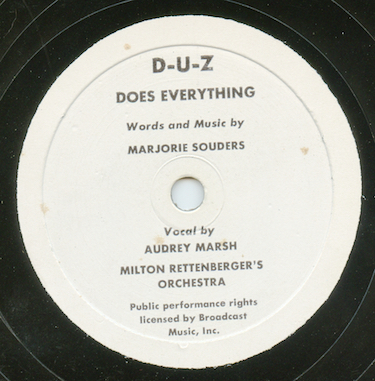 In this post, a promotional 78 from the makers of Duz featuring a three minute swinging arrangement of their “Duz Does Everything” jingle heard on many OTR programs. I don’t know the origin of this disc. Perhaps it was given to dealers or maybe as part of some giveaway promotion to customers. But now, through the miracle of the Internet, you can find out the rest of the lyrics to the song. The vocal is by Audrey Marsh, backed with Miltion Rettenberger’s Orchestra. I couldn't find anything on the composer, Majorie Souders. Don’t forget to give royalties to BMI if you play it on the air. By the way, according to Wikipedia, Proctor and Gamble sold Duz from the 1940s and discontinued the brand in 1980. Remember the free dishes that came with Duz? 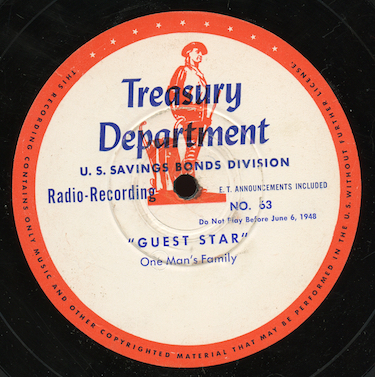 Our mp3 was dubbed from an original single-sided ten inch 78 rpm shellac or vinylite disc.